Masdar City, near Abu Dhabi, has set its sights on being the most sustainable city on the planet, and it is well on the way to meeting that goal. Development started in 2008 and is expected to continue for at least the next five years, with 40,000 people expected to live within its boundaries, and another 50,000 commuting to work there. “Masdar City is a template for sustainable urban development, and its evolution is taking place in partnership with a growing community of developers, investors and private sector companies,” said Anthony Mallows, Executive Director of Masdar City. All developments within Masdar City must meet a minimum ‘3 Pearl’ rating under the Abu Dhabi Urban Planning Council’s green building standards framework, Estidama, meaning they will be designed to be up to 40% more water and energy efficient than comparable existing buildings, while also using more environmentally friendly materials in their construction. This compares to a LEED Gold rating under the US Green Building Council’s rating system. Masdar Institute Campus – The Masdar Institute of Science and Technology (MI) campus is the city’s nucleus. After an expansion in 2013, the campus now has 323 residential units and accommodates several hundred students, more than 100 faculty and researchers, as well as four research centers, with an additional center dedicated to innovation and entrepreneurship. The MI campus covers 33,000 square meters (just over 7.5 acres) and provides a new benchmark as a model of sustainable living and academic development. 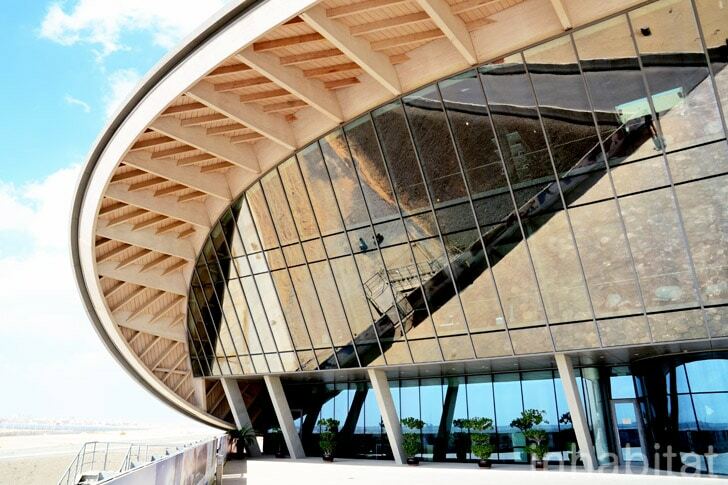 The Knowledge Centre – This signature building is the gateway to the Masdar Institute campus. The Centre is a model of sustainable design and sets a new benchmark for other energy efficient buildings. The building’s distinctive roof, while providing shade, minimizes the structure’s cooling load and controls natural daylight. In addition, the Centre’s orientation optimizes the efficiency of its rooftop photovoltaic array and thermal tubes. 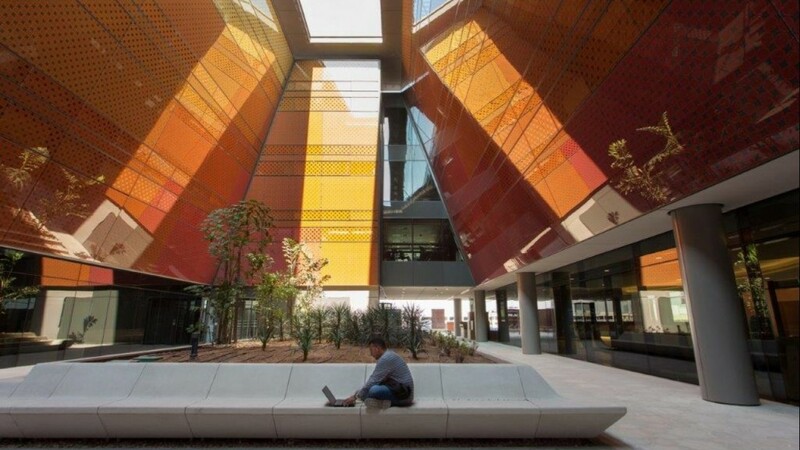 The 900 square meter (9,687 square feet) space hosts Masdar Institute’s library, which is used by students and researchers. of the businesses housed there. 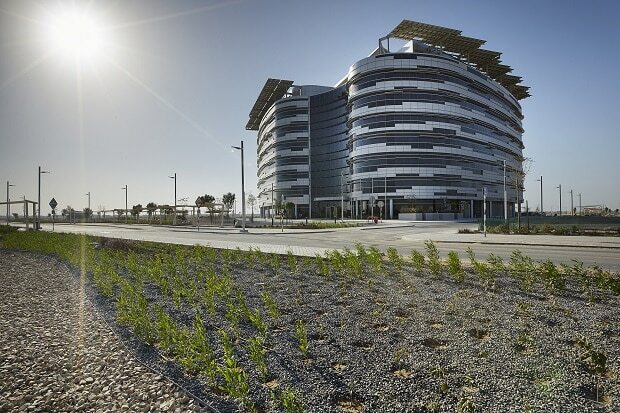 making it the first, and currently the only, 3 Pearl Estidama and LEED Platinum certified office building in Abu Dhabi. 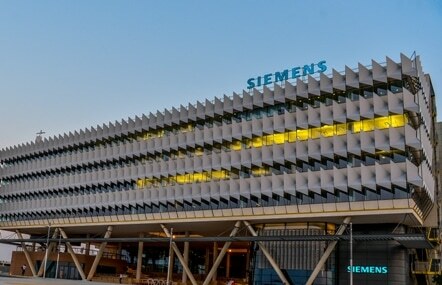 The Siemens Middle East HQ has an energy efficiency rating of 83% and consumes 64% less energy than typical buildings in Abu Dhabi. IRENA Headquarters – This complex, a three-block building completed during 2014, is the permanent headquarters for the International Renewable Energy Agency (IRENA). The 32,064 square meter (345,000 square feet) complex is the UAE’s first 4 Pearl structure under the Estidama Pearl Building Rating System. The passive design and smart energy-management systems enable the complex to achieve an energy efficiency rating of 78%, consuming 42% less energy than global energy efficiency standards and 64% less than typical buildings in Abu Dhabi.